Jaw Correction or Orthognathic Surgery is performed by an oral and maxillofacial surgeon to correct minor and major skeletal and dental irregularities such as misalignment of jaws and teeth. Surgery can improve speaking, chewing and breathing. While the patient's appearance is enhanced as a result of their surgery, orthognathic surgery is usually performed to correct functional problems. Who can need jaw corrective surgery ? Upper jaw (maxillary osteotomy): In this doctor will cut and remove the bone above the teeth so top jaw including mouth and upper teeth will move as one unit. Chin surgery (genioplasty) : It is used to correct a severely receded lower jaw, in this doctor will cut the chin bone and secures it in a new position. Our clinics, ReconFace and Ojas Aesthetic, best known in providing facial health services with quality and compassion. 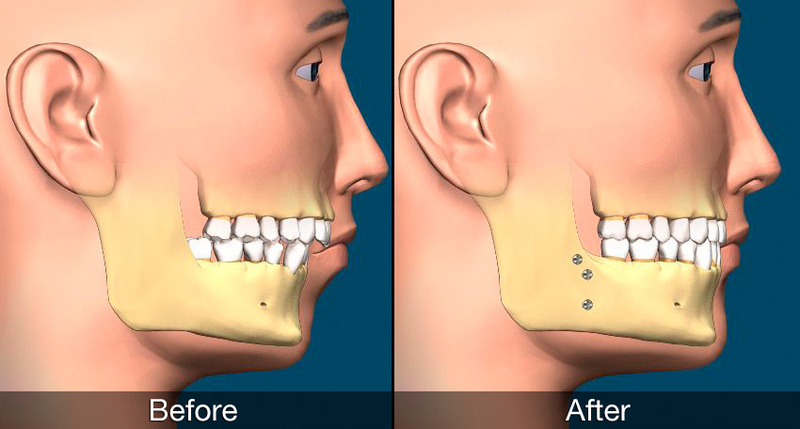 They offers best Corrective Jaw Surgery in Hyderabad with the help of dedicated team of doctors and other staff.